Blog | Heritage Quay | What will you discover? Netball is a boom sport and now its origins and development can be traced by visitors to Heritage Quay. It has become home to the England Netball Heritage Archive, a large collection of documents, pictures, videos and memorabilia covering the history of “women’s basketball” – as it was originally known – from 1897 to the present day, including recent highlights such as the exploits of the England team, which vanquished Australia to win Gold at the 2018 Commonwealth Games. Based on American basketball, netball was created in England in 1897 at the Bergman-Österberg Physical Training College for Women, in Dartford. By 1900, the rules had been published and the game soon spread across the British Empire. The All England Net Ball Association was founded in 1926 and in 2016 the modern body England Netball was awarded a grant by the Heritage Lottery Fund to mark the sport’s 90th anniversary by creating an archive. When the anniversary celebrations had concluded, England Netball sought advice on the best permanent home for the collection, and the UK’s National Archives recommended the University of Huddersfield’s Heritage Quay. One of the most publicly accessible and advanced facilities in the sector, it also houses the archives of the Rugby Football League. 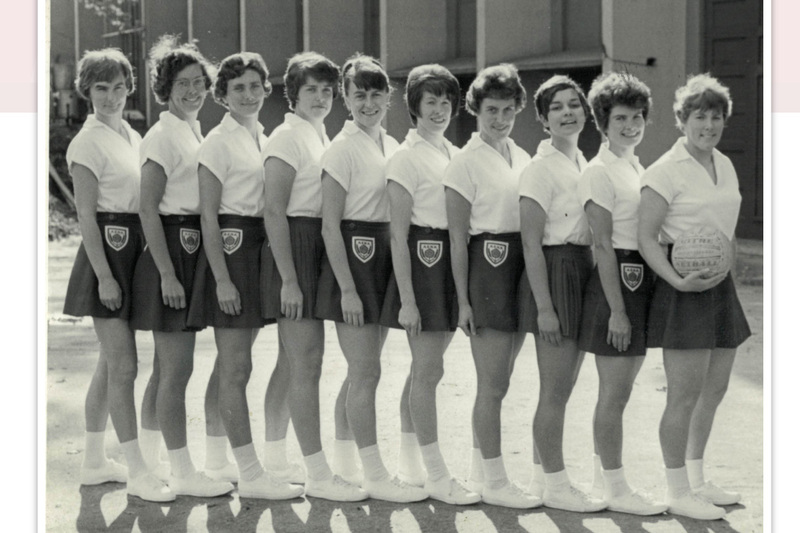 Now it becomes even more attractive to sports historians and enthusiasts by homing the extensive England Netball Heritage Archive, which is fully catalogued online. August 1967 – England Squad of 10 selected to go to Australia for the 2nd World Tournament in Perth and then to tour Australia. At a special launch event, guest speakers included Liz Nicholls CBE, a former netball international herself who is now CEO of UK Sport. Current England Netball CEO Joanna Adams also spoke, and there was a welcome from the historian Professor Tim Thornton, the University of Huddersfield’s Deputy Vice-Chancellor. Also speaking was Councillor Mumtaz Hussain, the Deputy Mayor of Kirklees Council. After the opening speeches, netball enthusiasts at the launch event were the first to have the opportunity to examine items in the archive. Joanna Adams said: “Netball has grown massively and been thrust into the limelight, especially over the last 12 months since the England team won the Commonwealth Games for the first time in history. It is wonderful to now be able to look back on how it all began thanks to this archive, and to see how netball got to where it is today. To donate or loan netball memorabilia to the Netball Heritage Archive, contact ournetballhistory@englandnetball.co.uk. The special event at Heritage Quay coincided with the University of Huddersfield hosting the Under-17 Europe Netball Championships, taking place in its sports hall. 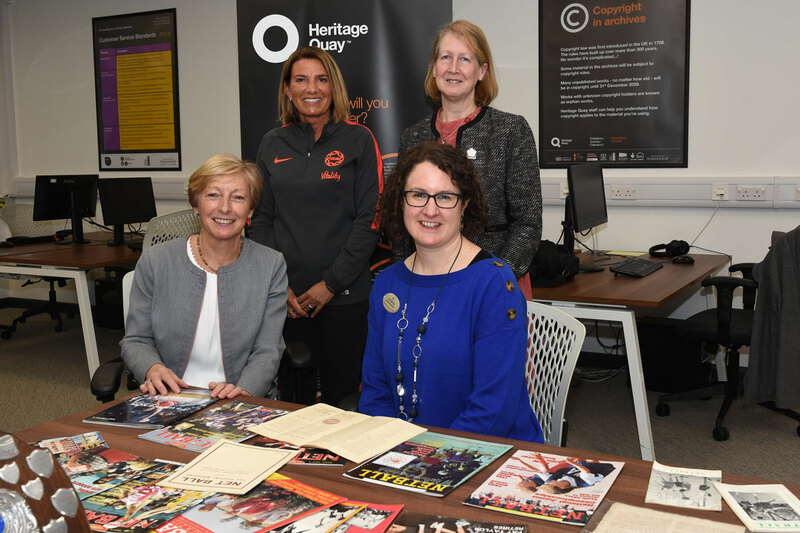 Pictured in the University’s Heritage Quay (l-r) CEO of UK Sport Liz Nicholls CBE, CEO of England Netball Joanna Adams, University Archivist and Records Manager Sarah Wickham and President of England Netball Lindsay Satori. My name is Rachael and this is my first blog as one of the new Archive Assistants at Heritage Quay. My duties include processing collections that have arrived at the archive to ensure they will be accessible to researchers, and one of the main tasks relating to this is cataloguing. This means data about the records is input into our database, which you can try browsing through yourself through our online catalogue here: http://heritagequay.org/archives/). In this blog I wanted to focus on one of the joys of working with archives- getting to study the creative process. I recently catalogued composer Catherine Kiernan’s papers which primarily includes musical scores (you can view the listing here). However, the item that caught my eye was a script and score for a play named ‘The Clan’. This file contains draft versions allowing you to see how the script was adapted as the play developed. The script features handwritten notes. For example, one note proposes where a song might be played and crossing out delineates where lines have been changed. These adaptations tell the story of how the play was adapted as the creators continued to work and provides insight into their evaluation process as they edit. There is a handwritten description of costumes, including the style and material that needs to be adorned for a Scottish clansman look. A note at the bottom explains that whoever wrote this did research about traditional Scottish dress by reading Peter Cochrane’s Scottish Military Dress. This is informative about the research process by highlighting what resources might be used as the play is being prepared. Clearly this individual found a history book valuable as inspiration for the costume design. This also tells us that historical accuracy was important for the creators and that they were trying to reproduce authenticity through the costumes. During termtimes it can be hard for the team to carry out work on new collections which means that they are available for researchers to use. During quiet periods, in common with many other archive services, we therefore close the research room usually for around a week and keep the time free of other activities such as teaching and meetings so that we can focus on big collections. As well as having plenty of space to spread them out if a lot of physical work is needed. During January 2019 we were closed from Wednesday 2nd – Friday 11th inclusive to work on two big collections: the Colin Challen (MP) Archive and the Sir Patrick Stewart Archive. The Challen Archive had been boxed (around 80 boxes) on its arrival at Heritage Quay but because of the quantity of material no other work had been done since it was transferred by Colin Challen in November 2017. During Collections Week the team were able to survey the material and to sort it into key series, mostly corresponding with Challen’s various roles and offices as a member of the Labour Party. The archive was also listed, and a small project identified for further detailed listing of the miscellaneous consitutency Labour parties in CHN/8 (planned for 2020). The catalogue is available on the Heritage Quay online catalogue at www.heritagequay.org/archives/chn and also on the Archives Hub/Archives Portal Europe. This part of the work took around 18 person-days and involved 6 members of the team. More details in a later post! We had undertaken some work on the Patrick Stewart Archive in a previous collections week, and took 6 person-days this time to expand and complete some of the work previously started. The catalogue for the Patrick Stewart Archive is at www.heritagequay.org/archives/psa/ – and again, more details to follow! Here’s one of the latest additions to the British Dance Band Collection held here at Heritage Quay. 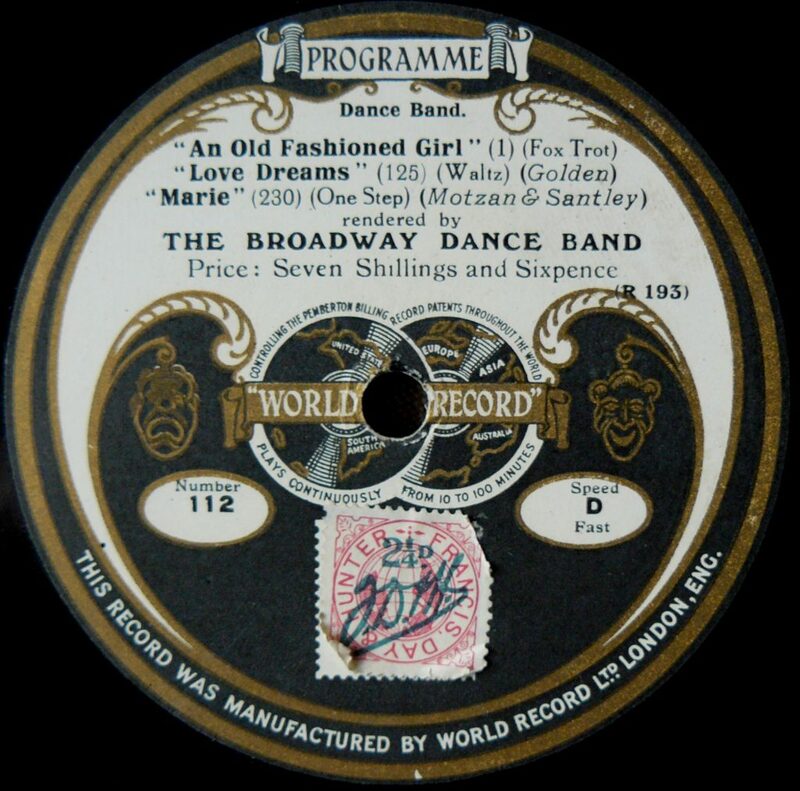 It is an exceptionally rare example of a World Record from the early 1920s. Unlike most of the collection wherethe records revolve at 78 r.p.m, World Records experimented with a system where the record starts slowly and gradually accelerates towards the record label. The theory was to reduce the deterioration of sound quality towards the centre of disc recordings where each rotation is shorter. For various reasons the “World” project was doomed with the eccentric polymath aviator, publisher, Member of Parliament and entrepreneur-inventor Noel Pemberton Billing (1881–1948) swiftly moving on to other things . However the system of “constant linear speed” was revisited much later with the introduction of CDs that revolve at a much faster speed when the laser gets close to the centre.The new acquisition will be difficult to transfer to an accessible MP3 as the team are still working out a way of using computer software for editing the sound files which will be recorded at a constant speed and then adjusted accordingly.